They are also hoping that a member of the public might be able to throw some light on the ghostly goings on that have been happening at the Station. Has anybody got a disused Railway Station wanting a good home? 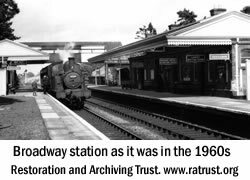 The Gloucestershire and Warwickshire Railway are well under way in their plan to restore the line from Winchcombe to Broadway and as part of that plan they intend to find a relacement station at Broadway for the one that was demolished in the 1960's. They have therefore launched a national hunt and volunteers have drawn up a list of disused station buildings. 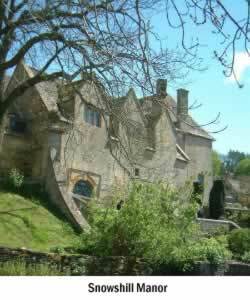 Snowshill Manor, a NT property near Broadway is an eccentric Cotswold Manor House and Garden which is an Aladdin's Cave of unexpected delights which is well worth going to see for it's contents and gardens alone. The Kiftsgate Rose is the largest rose in the UK. The Telegraph Gardening supplement voted Kiftsgate Court Gardens, near Chipping Campden as No.3 in the top ten rose gardens to visit . Kiftsgate Court is world famous for its Kiftsgate Rose which is the largest rose in the UK at almost 60ft high. 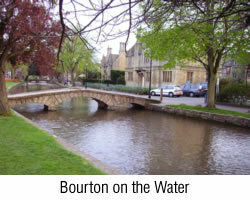 The Lonely Planet has called Bourton - "crass, commercialised and overwhelmed by coach tours" and said "that it was an exceptionally beautiful place that had turned theme park with a series of attractions....."
The Parish Council have hit back in defence of this popular village but what do you think? Our visitors seem to like it.